Both are available at the sign next to Warden Iolol. An easy quest for a capable group of 5. He does a knockback/thunderclap type of spell that does mild DMG. His melee strikes don't do very much at all. Durn is huge and wanders in a circular pattern around the Spirit Fields, you can't really miss him. I think that at level 66-67 you could 3-4 man this without too much trouble. I 5-manned this with guildies, a feral druid, a prot-spec war (me), a warlock, a hunter, and a holy-spec pally main healing. I recommend finding Durn and clearing a small area to fight in. He hit me (425 Defense, 10500 or so Armor) for about 1100-1200 per whack. He has a knockback (800ish damage I want to say) but it's pretty short so you don't really need to tank him against a mountain or clear a square mile of territory to fight him in. 2. Quickly clear a small area to fight him in. respawn is under 5 minutes. the ideal place to fight him is on the east side of Oshu'gun, around 45,72.
i just gotta say, that picture with the clefthoof is just amazing. Is that 1H Sword more of a tank weapon? Is no one else troubled by the fact that in the screenshot provided, he looks like he's sodomizing Banthar? HAHA! That pic...Is just..um...HAHA! Lovely. 70 rogue hunter druid warrior priest killed it easy. This guy was fun on my 68 restoration druid. I had a 70 druid tank and we two manned him. It took a little bit, but it was nice and easy. Lifebloom was really the only thing I cast with an odd rejuvenation on myself and the tank to counter the knockbacks. After last patch, easily solo'ed by 70 prot Pally in S1, crafted epics and blues. I'm not sure what other races have spell inturruption, but Shammies- when you see that bar, launch a Earth or Wind Shock. Maybe even save your shocks just for that... no knockback/aoe! Impossible to solo at 69. He hits for 1500-2000 on plate and he has a lot life... Managed to get him to 95% after I died (Blood DK). Eh you don't need 5 people. Me (level 67 feral druid) and a 66 balance/resto spec druid duo'd him with ease. I didn't get a chance to even put my tank gear on lol, I still had my cat form gear... and it still wasn't too bad. During the battle I got aggro from 1-2 other mobs, thats when it got a little tough. But we survived. lol seriously I just wanted to see if it rewarded a tanking sword and to find that screen shot waiting for me was absolutely priceless. Durn is a very strong mob, not to mention incredible large. He patrols the area around Oshu'gun in a clockwise circle and moves fairly fast. You'll want to get a group of 5 together for this one -- make sure you have a tank, healers and dps. He'll do an AoE knockback + damage; so before enganging Durn, make sure to clear out and area to fight him in - you definitely do not need adds during this fight. HAHAHAHAHAHAHA screen shot is amazing....perfect is all i can say, i literally lol when i saw it. On a serious note, ive downed him 3 times now and still no credit for the quest...anyone else with this issue? Just solo'd this as a lvl 80 BM hunter with 90% epic gear. He is a tough one. I was expecting a rather easy kill considering his level and mine. If solo'ing all other advice of clearing trash is a MUST. For hunters: Be careful not to pull aggro from your pet. auto-shot with a few stings here and there conserver your mana for mending your pet. Once he's low (about 25% health) his pushback hits even harder than before. expect your pet to lose a lot of health (below half). After he stomps the ground you can give him all you have to finish him off. Survived with 70% health (popped my "Lifeblood" after final pushback) and my pet at 30%. He was fun! Soloed as a 67 Demo lock in BoA gear. Curse of Weakness, Corruption, Health Funnel, Drain Life. Felguard had around 7k health and was never in danger of dying. My spell power was around 900, with Health Funnel ticking for ~550 per second. So im a prot warrior, level 70 in full feltsteel/cobalt with about 16,500hp. figured what the heck ill try soloing it. charged upto him, stomped and demo shouted, pop shield wall, rend him. basic warrior thing for soloing big mobs. when i was at about 50 percent hp popped my figurine of the colossus. gave me like 700 hp since he hitskinda slow i guess. when i got lower i popped last stand and a super healing pot. after all this i was almost dead and out of cds and durn was at a measly 51% so i shadowmelded and decided i couldnt solo him. just wasnt working. but hey was worth a shot i figured. maybe if i was in full emblem gear i could do it. the reason my hp is so high is i have 14x 24 stam gems on my. plus cobalt has some decent stam. update came back to him in sunwell/t6 gear and he went down pretty easily as expected for that gear level. upto 28k hp now. Just solo'd as a lvl 78 marks hunter. Took me a few attempts. Just let your pet tank and keep it well healed. The only problem for me was that I kept grabbing the agro off Durn and then having to feign death again and again. I was wearing mostly blues and a few greens. Took about 3 minutes. Quite an easy fight once I got it right. Two level 66 pally's can pull this off. 1 prot and 1 ret pally and it can be done. took approx 5 min, both at level 66 on 5-29-10 @2pm EST. BOYA! Did him yesterday solo as lvl 70 prot Paladin. Standard gear (cobalt plate). The knockback was worst then. Got in amongst other creatures that started helping him. This time I put my back against a cliff. I didn't move an inch when he knocked me. I took a while but I finally got him. Soloed as tier 9 geared level 80 MM hunter with wolf pet. Easy peasy at this level. My wolf hardly took any damage. Soloed by a level 67 prot pally wearing a mix of quest greens and instance blues. Simply attacked with Crusader's Strike and Avenger's shield and use my holy power to self heal. Have a clear spot and your back to something and it's not too difficult. Didn't even have to bubble or use LOH. Did this solo with my level 68 protection paladin. Just spammed Crusader Strike, Avenger's Shield, Judgement of Truth, Holy Wrath, and Concecration. Healed with Word of Glory, and Holy Light when necessary. It took about 3-4 minutes, using a weapon I obtained from an early quest in Northrend. I was able to solo this (though it took forever) on my lvl 67 prot pally. I needed the extra Flash of Light every now and then (he hits for like 2k at some points) but otherwise it was just a really long fight. Difficult, but doable. Just solo'd it lvl 66 prot pally.. pallys rule! I found this guy very hard to solo as a level 67 demo lock. I ended up doing it with someone else I bumped into wandering around Nagrand, although I think the solo kill should be just about possible. There are three difficulties: (i) he hits very hard, (ii) he has an awful lot of health and (iii) he patrols an area which is teeming with hostile mobs. The first thing to do is find a spot to ambush him where you're not going be interrupted by any adds. Unfortunately the adds do wander around a lot. I spent ages camping out at 48,68, then just when he turned up, a herd of Clefthoofs wandered across his path. I tried the usual strategy of sending in voidy, putting up dots, curse of weakness and summoning a doomguard, but unfortunately voidy was dead by the time I'd finished all that. So my new plan was to accept that I'd lose a demon, send in the felguard, hit felstorm to get a decent threat lead, curse of weakness, apply dots, hand of gul'dan. Felguard would die about that point, then I'd use the instant summon to get a void-walker, taunt, soul shatter, summon doomguard, spam health-funnel. I think that could work, but as I said, I've not actually implemented it. You have to use a Tenacity pet ( I used a beetle) and be spec’d for Beast Master. Any other spec just does not work, believe me I tried them all! Hunters Mark, Serpent Sting, Arcane Shot, kill command, steady shot, mend pet. Keep serpent sting on and rotate between kill command, steady shot and mend pet. You will likely be interrupted by wandering mobs, if you do then you have to take the mob out while spamming mend pet. Apparently Durn's wife did spot the photo of him with Ban'thar as he seems to have vital bits removed. As of Patch 4.3 he's no longer elite (same with Ban'thar) and his health is just 12k - a shadow of his old self. Poor Durn. Just soloed Durn with my warrior and then my priest. Both are level 73. The odd thing I noticed and Durn is not elite. Didn't he used to be? I was stuck at 74/75 for ages until I found out, that the QuestGiver for Durn the Hungerer had a blue Question Mark for the repeatable Quest. After clicking him you will see the Durn the Hungerer Quest. Phew, thats my Loremaster's Achievement now..
Actually, the short version misses a step. #1 Should "Cackles til you can no longer breathe at screen shot". ;) SO glad I looked up this quest to see that. Laughing so hard now I forgot why I searched for this quest. Soloed on 66 lock, took like 20 secs. Still 19k xp tho! I remember when you had to queue for ages for a 5 man group to kill him and wipes were frequent. He moves clockwise along his path. To make it easier to catch him, go counter-clockwise until you find and kill him. I remember when Durn used to be a force.... if at level, would take 2 or 3 peeps unless geared and could heal self.. now? 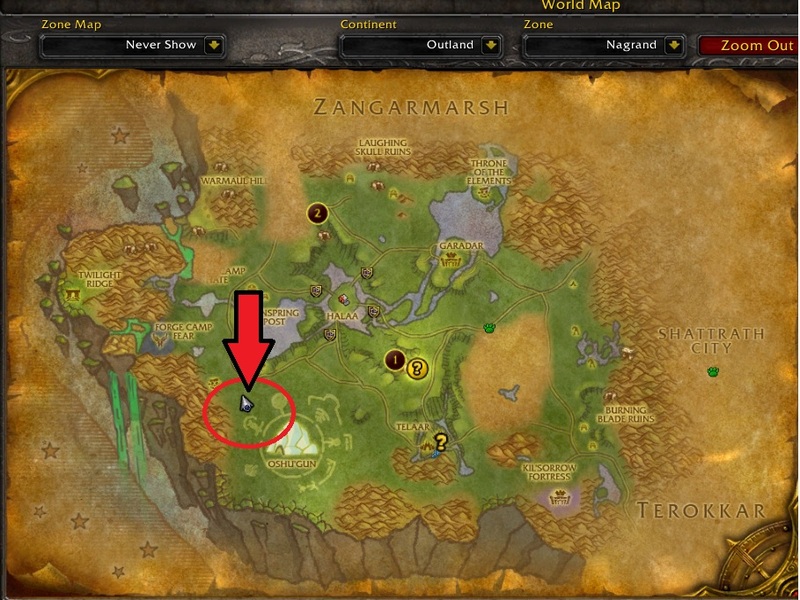 just sad.. same with the "bosses" on Nesingwary's quests.. those End "bosses" used to be really tough..
For those without coordinates, Durn the Hungerer spawns every 3-5 minutes at this location. Slay Durn the Hungerer. Return to Warden Moi'bff Jill if you manage to complete this task. You have destroyed two of the biggest threats in Nagrand, <name>. Are you ready to take on the scourge of the Spirit Fields? Durn the Hungerer lords over the area surrounding Oshu'gun, decimating all in his path. Thus far, none have been able to rid Nagrand of this ferocious gronn. Venture to the Spirit Fields, west of here, and track down Durn. Slay him and I assure you rewards commensurate with the difficulty of the task at hand. Durn's murderous grip has been loosed! Nagrand has a brighter tomorrow because of you, hero. Well done!